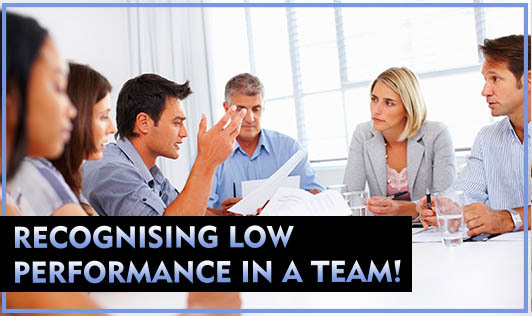 Recognising low performance in a team! Identifying low performance can be tricky, since every manager has his own personality and way of relating to his team. Furthermore, making sure the team works well together is vital to achieving success. • Goals are not being met: A first sign would be that an employee's goals are not being met. As a manager, you've set out certain goals in terms of what the job is supposed to accomplish. This is one of the clear-cut signs to look out for. • Employee relies on others to get work done: An employee relying too heavily on other team members to meet goals is a sure-sign of low performance. This is not a productive way to get things done, because the employee is draining resources from individuals that have other goals and expectations. • The quality of work suffers: As a manager, one needs to be able to identify and carefully explain to employees how their work is not up to par, and then defining what good performance would look like as opposed to what has been turned in. • Employee has difficulty working with co-workers: An employee having difficulty working with co-workers is another issue especially if it has an effect on another's ability to get the work done or on the organisations ability to meet its goals. Keep in mind that there is more to good performance than identifying what is wrong. A manager must back the diagnosis with active steps to fix the problems, preventing them from recurring, which requires resources, ongoing support and reviews of progress!